It's Tuesday and I'm sans Coconut tart. Honestly, I think Coconut tastes like sunblock and has the texture of something too unappetizing for a cooking blog. However, I have already made next week's Chocolate Berry Tart and it was delicious and photogenic! So until then, I'll leave you with a healthy and crowd pleasing recipe. 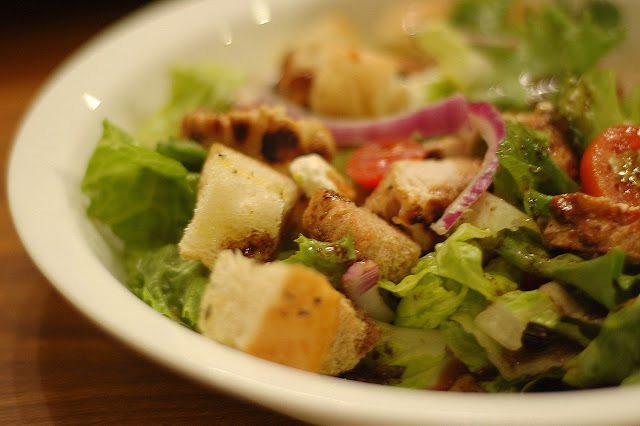 A big, grilled chicken and crouton topped salad is one of our favorite quick meals. I have to confess I've never actually liked croutons (why eat dried bread when you can eat it soft and fresh? Save the calories!)... until I tried the homemade variety. They are crunchy and delicious and an excellent vehicle for soaking up salad dressing. And this "recipe" isn't something to be afraid of- it's a way to save yourself from running to the store because you forgot to buy croutons again (because you didn't like them in the first place, how would your new-baby-sleep-deprived brain remember) and your husband insists on having them with his salad. I'm including a real life crouton making picture to show how easy these really are. Pretend like you can see my little man running around, Baby Strawberry squawking, and you get the idea. 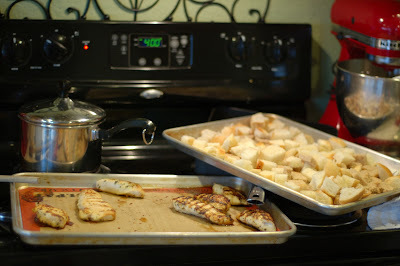 They literally take two minutes to throw together, even with other stuff going on, and are a great way to use up leftover bread before it gets too stale (see in the picture? leftover hard rolls and wheat bread, pretty much just the heels). I like to toss on some favorite herbs and when my Tall Man sees I've actually made croutons he even flashes me his real smile. You should try it, too! If you're married to a Mr. Carbohydrate like I am this is something you should do often. I try different herbs, often depending on what I find first when I reach in my overly full cupboard. I usually bake them at whatever temperature the oven is already set on. Like I said, these are easy. And delicious. Go go! I'm not a huge fan of croutons either but I don't think I've ever tried making them at home. I'll have to give it a shot! I love coconut, but would have been fine without the custard tart. I made two minis. I'd rather have that salad with croutons though! MMM i love croutons. Is it bad if thats my favorite part of a salad? HA! great blog! I just started one too, hope you can stop by! Oh, I love croutons! I used to work at a little soup and salad place and they'd make fresh croutons daily. I'd put some in a bag and snack on them out of my apron all day. Yum! I'll be making these soon now. Love your recipes Anne. I have just gone through your entire blog and looked for the recipes that took me. Can't wait to make some of them. My boys are really enjoying my cooking. And I'm loving it too. I shall be adding you to my blog. Cheers! You are right, nothing compares with homemade! I'm not a big fan of store-bought croutons, but homemade sounds great! You can flavor them as you like, still have them slightly warm (I love the contrast of warm with cool, crisp salad) and make them whatever size suits your fancy. Great idea and recipe! Croutons make all the difference in a salad. I should make my own. If you are interested in a cookware giveaway, stop by my blog. Those look delicious. I love the carbs so I've done similar before. Wanna know what else you can do? Cook them with bacon drippings. mmmmm perfect with a spinach salad. also, during the week I often don't have the oven heated up so I do it in a skilled. Great recipe, thanks. The French have a saying about Americans...the translation goes something like this: "Well, what can you expect (eyes rolling, shoulders shrugging, exasperated voice), the Americans, they BUY croutons!" It is not meant as a compliment...LOL. The French make croutons from stale bread and whip them up as a matter of course, being frugal, etc., they think Americans are nuts to buy croutons. Just sort of a funny view of us from others. I am sure the French would approve of your croutons! Not that you need their approval. I just came across your blog and its wonderful! I am now a follower! 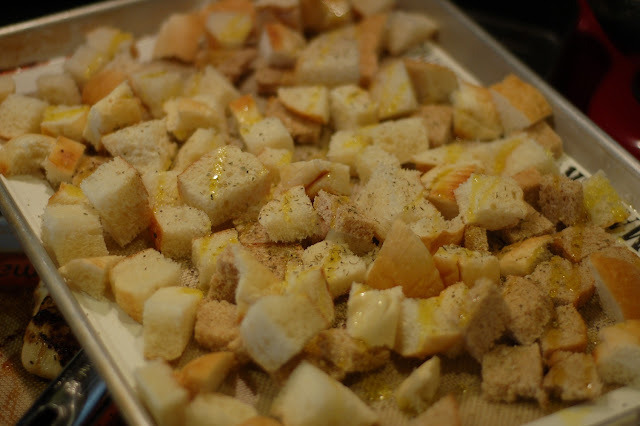 Croutons are amazing, but I have never made them at home! Will give them a try! Funny post! And here we are loving all things coconut in my house! My coconut bread is heavenly toasted! Homemade croutons are definitely the way to go...and they take no time at all AND you can store them. I love croutons in my salads and in soup! Great recipe! These look like they would be worth the time and effort. And how much tastier they look that the store bought ones! Thanks for inspiring!! I love homemade croutons too. Kinda reminds me of that first step for bread salad, which is another fave. I do like croutons in a salad but I admit, I have not seen croutons like these. I want to scoop them up and eat them plain.